Today I’m feeling a little bit inspired, so I decided to experiment with some of the Mexican ingredients I brought from Mexico and I came out with this delicious salad. It is very light and with lots of interesting flavours, I added some dried crickets to mine, but you can always avoid this ingredient. 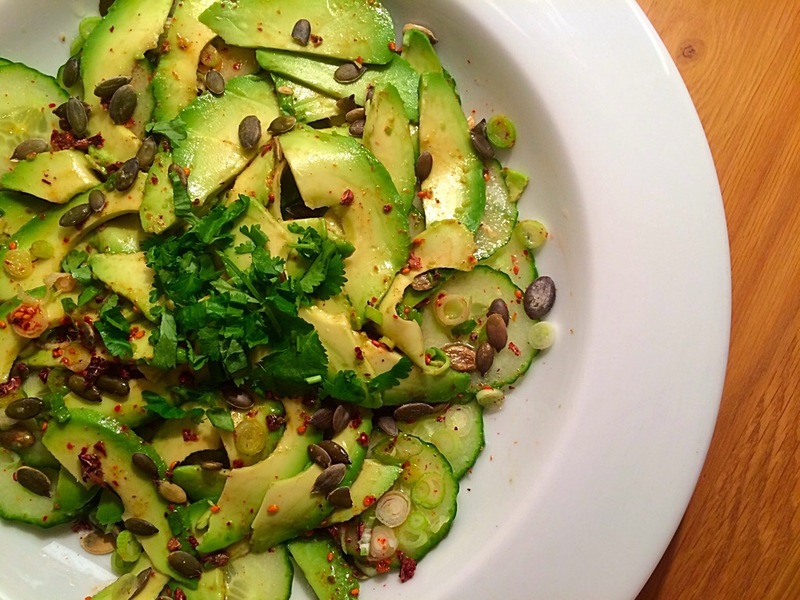 The cucumber and avocado go very well together and the spicy pumpkin and sesame seeds add that Mexican flavour to the salad. It is a very easy salad to make and perfect as a vegetarian option, I am sure “el ingles” is going to love it and after the feast we had yesterday for the Day of the Dead, this salad comes quite handy, so I do not feel guilty. Place the cucumber on a large salad plate and add the avocado on top, then scatter the pumpkin seeds, sesame seeds, spring onion and coriander. Make a quick vinaigrette with the lemon juice and olive oil and add salt to taste. Add some crushed dried crickets if you are food adventurer if not, avoid this ingredient. If you can’t find spicy sesame seeds, you can make your own, just mix some cayenne pepper to some sesame seeds.